Godzilla and Ebirah duke it out in GODZILLA VS. THE SEA MONSTER (1966). When I was a kid in the 1970s watching Godzilla movies on the Creature Double Feature, GODZILLA VS. THE SEA MONSTER (1966) was not one of the Godzilla flicks that made the rounds back then. I didn’t see it for the first time until the mid 1990s. GODZILLA VS. THE SEA MONSTER is one of the early “silly” Godzilla movies, films where Godzilla pretty much is a giant monster superhero saving human kind from monsters, aliens from outer space, and assorted human villains. Here, he takes on human villains and the giant sea monster known as Ebirah. My favorite part of GODZILLA VS. THE SEA MONSTER is the story it tells and the characters it creates. Most of the time, the storylines in the old Godzilla movies were pretty bad, and the characters uninteresting. In fact, in general, you had to sit through a pretty boring movie and wait for Godzilla to show up before things got interesting. But that’s not the case here with GODZILLA VS. THE SEA MONSTER. It boasts one of the more fun stories in a 1960s Godzilla film, and it certainly contains some of the series’ more interesting characters. Basically, a young man in search of his brother who had been lost at sea convinces two of his friends to help him steal a boat so they can search for his missing brother. It turns out, the boat they choose happens to be inhabited by a jewel thief named Yoshimura (Akira Takarada) who’s hiding inside the boat. Eventually, the four men find themselves shipwrecked on an island run by evil militants who are running a slave trade, and these militants are protected by the giant sea monster Ebirah. Lucky for our heroes, they discover Godzilla sleeping inside a cave and use lightning to wake him up, and of course, being Godzilla, he immediately gets cracking at seeking out and destroying all the evil elements on the island. It also turns out, that the missing brother found himself on Mothra’s island, and so eventually Mothra shows up to help out when Godzilla’s intentions aren’t all that clear. That’s the fun thing about Godzilla. Sure, he’ll smack down the bad guys, but that doesn’t mean he won’t stomp on the heroes as well. If this sounds silly, that’s because it is silly, but it’s all framed in a quick-moving fun storyline in which jewel thief Yoshimura often has to use his “thief skills” to help get his new young friends out of jams. Plus there’s a hopping 1960s music score that sounds like a cross between the Adam West BATMAN TV show and a Sean Connery James Bond movie. But the bottom line is the entire flick is a heck of a lot of fun, and it’s one of my favorite GODZILLA movies from the 1960s. Akira Takarada, who plays Yoshimura the jewel thief, also starred in the original GODZILLA: KING OF THE MONSTERS (1956) as the heroic Ogata, as well as in KING KONG ESCAPES (1967). He’s excellent here as Yoshimura. Takarada’s co-star from first GODZILLA, Akihiko Hirata, who played Dr. Serizawa in that film, plays the villainous Captain Yamoto here. Both actors have appeared in multiple Godzilla movies over the years. Hirata passed away in 1984 at the age of 56, but Takarada is still with us. The other interesting thing about GODZILLA VS. THE SEA MONSTER is that it was originally written to be a King Kong movie, a follow-up to KING KONG VS. GODZILLA (1962). 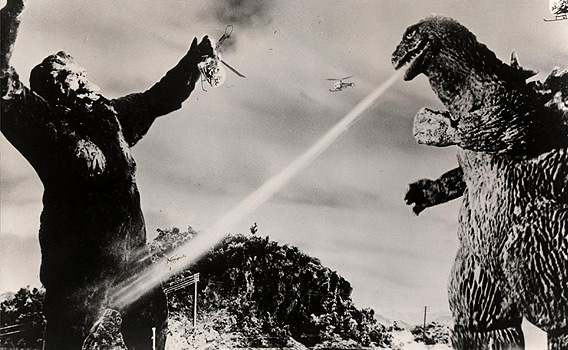 Eventually that idea was scrapped, and Kong was replaced by Godzilla, which explains some of the different behaviors displayed by Godzilla in this movie. First and foremost, Godzilla is very protective of the lead female character here, which isn’t indicative of Godzilla’s behavior in any other movie. On the other hand, showing affection towards the female lead is one of Kong’s signature movie traits. What a Lothario! Godzilla is also found sleeping inside a cave, where in other films he pretty much lives in the ocean, and he’s strengthened by lightning, which is how Kong was strengthened in KING KONG VS. GODZILLA. The battle between Godzilla and Ebirah is okay, and there have been far better monster battles in other Godzilla movies, but the strength of this film is the better balance between Godzilla scenes and the scenes featuring human characters. When Godzilla is not on-screen, the action here is still engaging and fun. GODZILLA VS. THE SEA MONSTER is not one of more popular Godzilla movies, but it’s certainly one of the more entertaining ones. Definitely check out GODZILLA VS. THE SEA MONSTER. Watch Godzilla battle that giant lobster monster Ebirah, and if you’re lucky enough, there might even be some leftovers for a hearty seafood platter. Pass the tartar sauce please. For a monster born more than 50 years ago, Godzilla may be more relevant now than ever before. The movies just keep on coming. The latest Godzilla movie arrived last year with SHIN GODZILLA (2016) to a limited release here in the U.S., and it received some pretty good reviews. And there is another film in the works, GODZILLA: KING OF MONSTERS, due out in 2019, from the same folks who made the Bryan Cranston GODZILLA (2014). All told, there have been 31 Godzilla movies to date, and it doesn’t look like they’re stopping any time soon. But today’s movie comes from that time when Godzilla was a silly monster superhero, constantly saving the world from the evil and bad monsters. Silly stuff for sure, but also the type of Godzilla movie that a lot of us grew up with. Today IN THE SPOOKLIGHT it’s one of my favorite Godzilla movies from the 1970s, GODZILLA VS. GIGAN (1972). This one sat on the shelf for a few years before being released in the U.S. in 1978 with the title GODZILLA ON MONSTER ISLAND. It was supposed to be a return to the traditional Godzilla format, after the offbeat message-driven GODZILLA VS. THE SMOG MONSTER (1971), a film I did not enjoy as a kid, but it’s one that has definitely grown on me over the years. In GODZILLA VS. GIGAN, aliens from outer space are once again trying to take over the Earth, and they employ space monsters Gigan and King Ghidorah to help them. To defend the Earth, humankind turns to their giant monster friends Godzilla and Anguirus for help. And defend the Earth they do, in one of the series’ better and longer climactic monster bashes. And there you have it. That’s pretty much GODZILLA VS. GIGAN in a nutshell. What did you expect? Shakespeare? I find GODZILLA VS. GIGAN particularly enjoyable for two reasons. The biggest reason is the aforementioned climactic battle. It’s one of the best in the series. That being said, in terms of monsters, this one gets off to a slow start, and it seemingly takes forever for Godzilla and Anguirus to show up, but once they do, nearly the final third of the movie is one long and rather exciting giant monster bout. The other fun thing about GODZILLA VS. GIGAN is its human characters. While the space villains are your typical bad guy types, the heroes in this one seem to have stepped out of a Scooby Doo cartoon. They’re young and they’re hip. Groovy, man! We have a young cartoonist who draws monsters, a young woman looking for her kidnapped brother, and her male friend, a classic hippie who can’t seem to stop eating corn on the cob. I guess Scooby snacks weren’t available. These three provide lots of light-hearted fun during the people parts of this monster flick. GODZILLA VS. GIGAN is also the film famous for being the movie where Godzilla actually talks! Yep, words come out of Godzilla’s mouth as he talks to his buddy Anguirus. It’s a ridiculously silly scene, and Godzilla and Anguirus sound like Yogi Bear and Boo Boo. It’s awful. The good news is, we live in the age of DVDs and Blu-ray, and these discs often include the original Japanese versions as well. So, you can watch the original Japanese version in which Godzilla and Anguirus do not talk. Oh, they communicate, but through sounds rather than words, and it’s very obvious that they are communicating. Unfortunately, the American distributors didn’t think their Godzilla audiences were intelligent enough to figure this out, and so they added the ridiculous English language dubbing. GODZILLA VS. GIGAN was directed by Jun Fukuda, no stranger to the Godzilla franchise, as he directed five movies in the series. In addition to GODZILLA VS. GIGAN, GODZILLA VS. THE SEA MONSTER (1966), SON OF GODZILLA (1967), GODZILLA VS. MEGALON (1973), and GODZILLA VS. MECHAGODZILLA (1974) were all helmed by Fukuda. Shin’ichi Sekizawa wrote the screenplay, based on a story by Takeshi Kimura. Kimura wrote the screenplays to some of my favorite Toho movies, including RODAN (1956), THE WAR OF THE GARGANTUAS (1966), and KING KONG ESCAPES (1967). Are there better Godzilla movies? Certainly! But in terms of fun Godzilla movies, GODZILLA VS. GIGAN ranks near the top. Of course, the big question for Godzilla fans is, how does Godzilla fare in this one? Well, truth be told, it’s not one of the big guy’s better performances. The costume looks rather silly here, and it does take Godzilla forever to finally show up and take on Gigan and King Ghidorah. There really isn’t a good balance here of Godzilla scenes. It’s pretty much all or nothing, with the “all” coming in the film’s final 30 minutes or so. But the climactic battle is worth the wait. Plus, Godzilla’s goofy appearance kinda fits in with the rest of the movie, a 1970s romp. You almost expect to see Cheech and Chong show up. It would actually make a nice companion piece with Hammer’s DRACULA A.D. 1972 (1972). Want a cure for the winter blues? Watch GODZILLA VS. GIGAN and see Godzilla and Anguirus take on Gigan and King Ghidorah in an all-out monster bash. It’s a sure-fire way to smash out the cold weather doldrums. Like most other horror/monster movie fans, I’m eagerly awaiting the release of the new GODZILLA reboot, scheduled to hit theaters on Friday, May 16. I can’t wait. So, in the meantime, I’ve got Godzilla on my mind. As a kid, I loved the Toho Godzilla movies, and the first one, GODZILLA-KING OF THE MONSTERS! (1956) even gave me nightmares. Godzilla in that first flick was oh-so-scary! The thunderous sound of his footsteps alone terrified me. 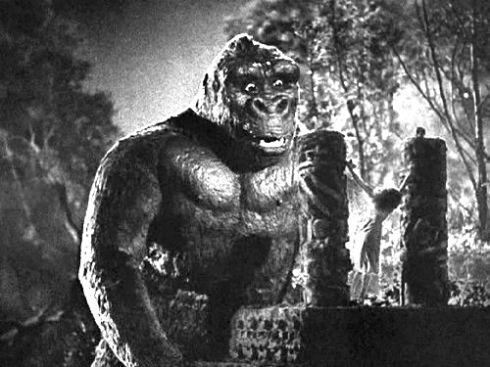 But my favorite Godzilla movie from the 1960s was KING KONG vs. GODZILLA (1962) because it included my other favorite giant monster, King Kong. 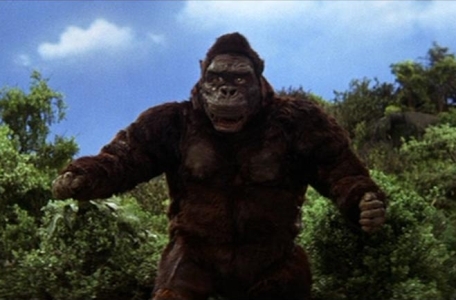 KING KONG vs. GODZILLA is a silly movie, anyway you slice it. 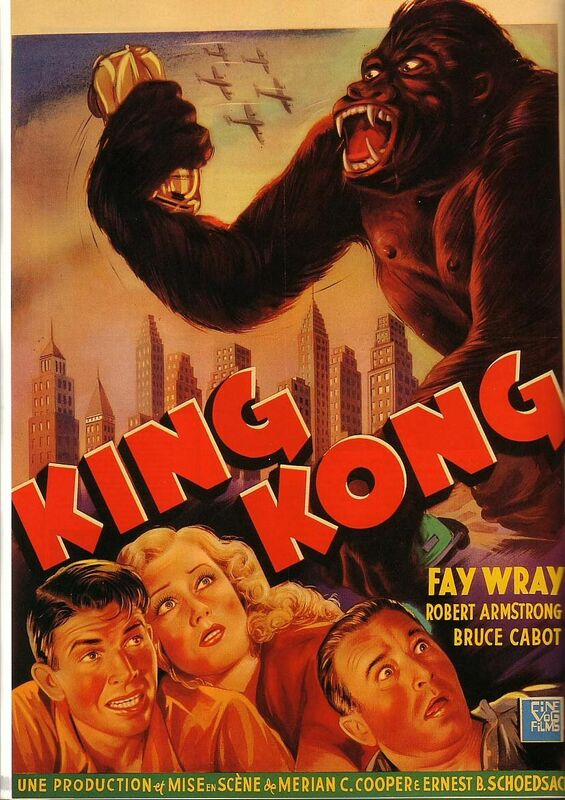 It features the worst looking King Kong in the history of the movies. 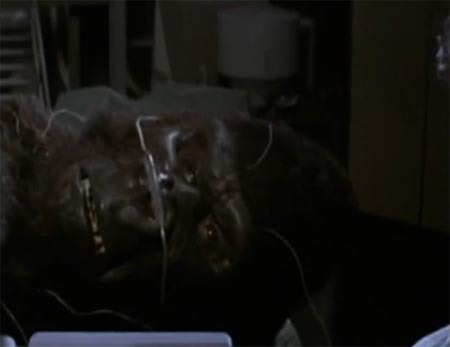 Kong here is so bad that even the gorilla suit used in the old Three Stooges shorts looked better. The awful Kong looks like a ragged beat-up stuffed toy, something the family dog plays with. He looks like King Louie from Disney’s THE JUNGLE BOOK (1967) on steroids with a hangover. 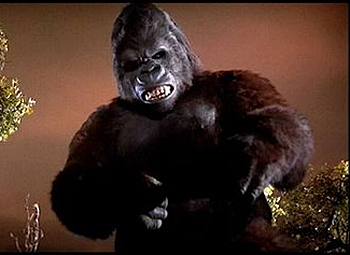 The dialogue is goofy, and most of the Kong scenes are played for laughs until the end when he finally meets Godzilla. However, the Godzilla scenes in this one are actually pretty good, with memorable scenes of Godzilla battling the army, attacking a train, and just looking menacing and plenty scary. And of course, the best part of the movie is the climactic battle between King Kong and Godzilla, pictured here, a bout that does not disappoint. It’s among the best Toho monster battle scenes in the entire series. I love it. In fact, I love the whole movie, in spite of how silly it is, for a number of reasons. Number one is the pure nostalgia of the film, as it brings back memories from my childhood, but also this movie and Godzilla films in general are simply fun to watch, in a mindless sort of way. It’s just a hoot to watch an hour of bad dialogue followed by colorful scenes of Godzilla beating up on the military and then on other giant monsters. 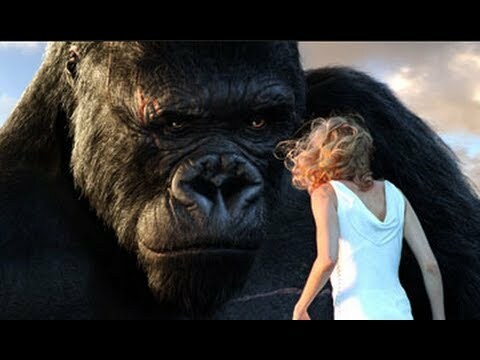 In this case, he meets his match with King Kong, which shouldn’t be the case since Godzilla is 400 feet tall and the original Kong was around 40 feet tall. Did I mention this movie was silly? That being said, I have to admit that I’ve only seen the American version, and to my knowledge, for some bizarre reason, the Japanese version still has not been released here in the United States. Let’s get with the program, people! Release the damn movie, already! And you can’t talk about KING KONG VS. GODZILLA without mentioning the urban legend which has been around for as long as the movie, that the film was shot with two different endings, with Kong winning in the American version, and Godzilla winning in the Japanese version. Supposedly, this just isn’t true, as Kong wins in both versions, or so they tell me, since I still haven’t seen the Japanese version which still hasn’t been released here in the States! In today’s picture of the day, we see King Kong about to do battle with Godzilla as helicopters fly about in the background, and Kong even clutches one in his hand. I believe this is a publicity shot because I don’t remember this scene actually appearing in the movie. Sure, they do battle, but I don’t remember Kong smashing a helicopter. 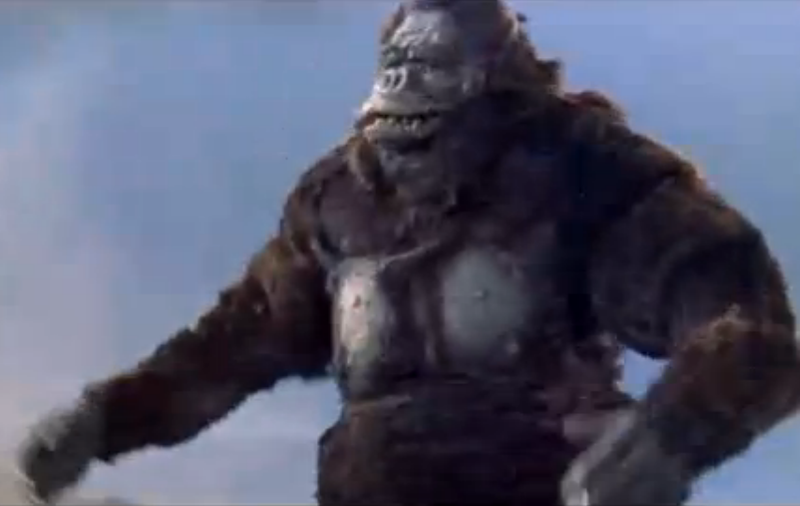 Kong actually looks like he’s about to hug his old friend, Godzilla. Godzilla, dude, long time no see! Gotta love that Kong suit! So, there you have it, today’s picture of the day, a publicity shot from my favorite Godzilla movie from the 1960s, KING KONG VS. GODZILLA. Of course, there are other Godzilla movies that I like better than this one, from other decades, but that’s a story for another day. Until then, enjoy the picture, and let’s all hope than on May 16 we’re treated to a worthy reboot which would make Godzilla proud, and Kong too, for that matter, when GODZILLA (2014) hits theaters. Here’s hoping Godzilla stomps his way back to the top!